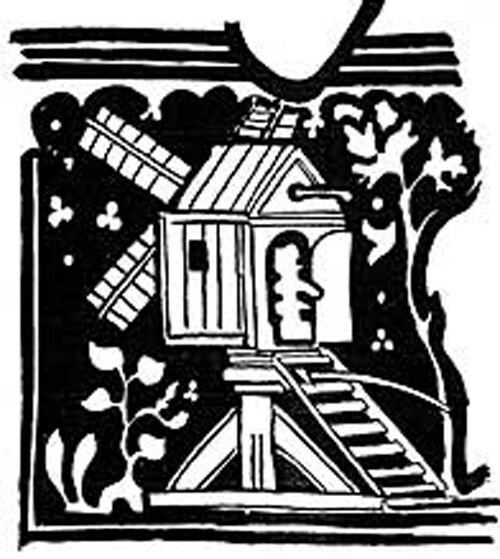 The earliest known reference to a windmill in Nonington is in a 1309 Latin document recording the transfer of ownership in the Manor of Ackholt from John (1), the son of Stephen de Akolte (Acholt) to John (2), the son of Thomas de Akholte, and Lucia, his mother, of a windmill (unum molendinum ventifluim) in the parish of Nonington near Holestrete (Holt Street) on Freydviles (the Manor ofFredville) land and two shillings and two hens free rent (duos solidos et duas gallinas de libere redditu) from Thomas le Kete of Holestrete, who was presumably the miller. The Fredvile land in question was almost certainly Cookys, later Cooks Hill, which was recorded as being a part of the Akolte estate in the 1440’s. The windmill appears to have been located just to the north of the site of the old Snowdown Collier pit baths and car park on the brow of the hill on the west side of the road up from Holt Street. The site would have been well served by roads to Ackholt, Holt Street in Nonington, and to Womenswold and Woolege Green. 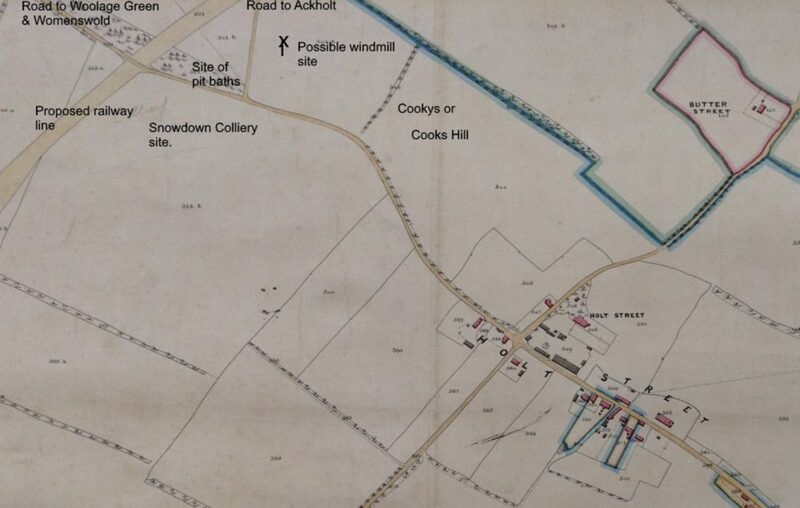 As can be seen on the 1859 Poor Law Commisioners map below, the road up from Ackholt which now joins the main road from Holt Street on the south side of Snowdown railway bridge then joined the Holt Street road some two hundred yards or so closer to Holt Street approximately where the gate now goes into the field. The road was re-routed when the railway line was actually built in 1860, a year or so after the map, which only shows the proposed route of the railway, was drawn up. 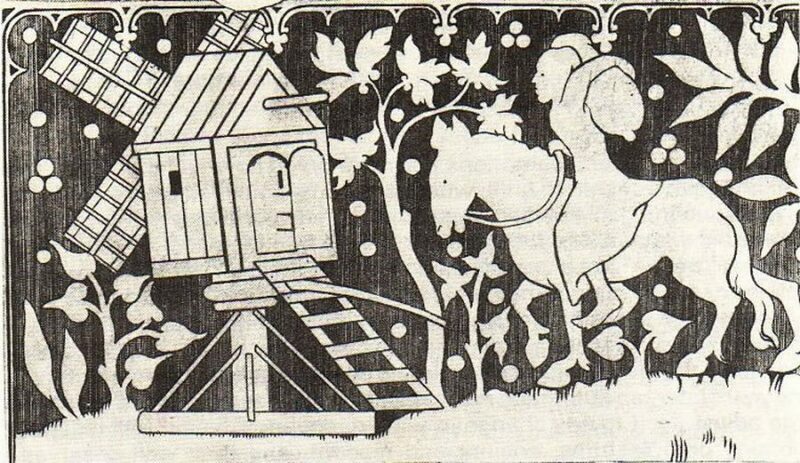 In 1341 John de Acholte granted the mill along with other property and rents in Nonyngton, Rollynge (Rolling) and Wimelyngewelde (Womenswold) near Crodewode (Crudeswood or Curleswood) to Peter Heyward. After this transfer there is no presently known reference to this mill, so it would appear to have gone out of service and was not replaced. These early post mills were usually constructed with two crossed beams resting on the ground and four angled beams coming up to support a central post, usually wooden, around which the superstructure of the mill was built. These cross beams were often buried stop the mill blowing away in a storm. This style of construction allowed the mill to be turned to face the wind by using a long beam attached horizontally to the body of the mill. Often the windmills were built on a specially constructed mound, although sometimes an existing barrow (burial mound) was used, to increase exposure to the wind. The sails on the early mills were sometimes only six or seven feet long, much smaller than those on later mills. Eswalt and the neighbouring manor of Essewelle had once been part of of the manor of Oesewalum, also Oeswalum and Oseuualun, which had belonged to Christ Church Cathedral Priory in Canterbury and then came into the possession of the Crown, probably during the latter part of the 10th century. The Domesday Survey of 1086 records that during the reign of King Edward the Confessor [1042-1066] Eswalt was held by Alnoth Cild or Cilt, also known as Alnod or Aethelnoth Cild or Cilt. Some 19th century, and later, reference books state that Cild or Cilt refers to royal birth and that Alnoth was a younger brother of Harold Godwinson, briefly king of England before his defeat and death at the Battle of Hastings in 1066. Other more recent works believe Cild or Cilt, translates as “the young or younger”, or possibly “noble”, and that he was not a brother of Harold. Young Alnoth, also Alnoth of Kent and Alnoth of Kent, was a major landholder in 1066, with several very large estates in Kent, Surrey, Sussex, Hampshire, Buckinghamshire, Northamptonshire and Oxfordshire, totalling over 180 hides. His estates in Kent and eastern Wessex alone had a value of £260. Eswalt was his only estate in East Kent, the others: Chart Sutton; Eccles; Boxley; Bilsington; Pimp’s Court in Loose; West Farleigh; Hawkhurst,; and Merclesham were all in the west of the county. Possibly the fact that Eswalt straddles the road running from Sandwich to Eastry through Nonington and on through the Elham Valley to Lyminge and Lympne is of some relevance. Also the northern edge of Eswalt there is a possible estate boundary formed by Cherry Garden Lane, referred to in the 16th century as St. Margaret’s Street, which runs from Canterbury to St. Margaret’s Bay. Cherry Garden Way crosses over the Sandwich to Lympne road forming a cross-roads which again may be relevant to the importance of Eswalt. Alnoth was a friend and protégé of Harold Godwinson and in the Kent Domesday Book there is a reference that “’Through Harold’s violence AlnothCild stole from St Martin [of Dover] Merclesham and Hawkhurst, for which he granted the canons an unequal exchange”. Harold provided support to Alnoth enabling him to hold on to the two estates taken from the canons of St Martin’s Church at Dover for which the canons claimed they had been given an unfair exchange. Alnoth was an important man in Kent, especially in and around Canterbury, and he may have had ancestors who had been ealdormen. The Kent Domesday refers to the fact that when the King came to Canterbury or Sandwich he was obliged to provide food and drink for members of a bodyguard provided for him by Alnoth Cild and other landowners of similar status. It’s possible Alnoth was the portreeve of Canterbury, which would at least in part explain the often used “of Canterbury” suffix to his name. The office of portreeve was a Royal appointee with its origins in the reign of Edward the Elder [899-924]. A pre-Conquest portreeve was responsible for the collection of taxes and to ensure that trade was not conducted outside of the port without the supervision of the portreeve or his deputies. A port was a town or borough with a designated market, and was not necessarily a sea-port. At this time the English system of civil administration and its efficiency in collecting taxes to provide the Crown with an impressive regular annual revenues was the envy of Scandinavia and Northern Europe. The large sums raised annually were certainly one of the main reasons for Duke William of Normandy wanting the English throne. King Edward the Confessor’s income has been calculated to have been some £6,000 per annum, and Earl Godwin, Harold’s father and by far the richest of the great earls and the most powerful man in England, had an annual income of some £4,000. Rich pickings indeed for William. After the defeat of Harold Godwinson at the Battle of Hasting’s by William of Normandy in October of 1066 Alnoth was allowed to retain his holdings, and when the newly crowned William I, the Conquer, returned to Normandy in March of 1067 Alnoth was one of several prominent Englishmen who accompanied William as “honoured guests”, in reality hostages. When he returned to Normandy William left Odo of Bayeux and William FitzOsbern as regents of England. There are conflicting reports of what happened to Alnoth. One report records he never returned from Normandy, another that on his return he was imprisoned at Salisbury until his death. However, what is known is that William I gave all of Alnoth’s estates, including Eswalt, to Odo, Earl of Kent and Bishop of Bayeaux, and also half-brother of the King. Whether or not Alnoth had some connection with the 1067 Kentish Rebellion against Odo is not known, but if he had supported it that could explain why he disappeared. The Domesday survey of 1086 records that Eswalt was one of the holdings of Odo, Bishop of Bayeaux and recorded as: “In Eastry Hundred………….Aethelwold held ESWALT from the Bishop (Odo, Bishop of Bayeaux), It answers for 3 sulungs. Land for… In lordship 1 plough. 6 villagers with 2 smallholders have 3 ploughs. 2 slaves; a little wood for fencing. Value before 1066 £9; now £15. Young Alnoth held it from King Edward”, (translation from “History from sources, Domesday Book of Kent”, by Phillimore, published in 1983). Bishop Odo, William I, and Robert de Mortain. From the Bayeaux Tapestry. Odo, Bishop of Bayeaux was the half-brother of William I, the Conquerer, their mother was Herleva of Falaise. Odo was created Earl of Kent by William in 1067 to reward his support during William’s invasion and subsequent conquestof England. The earldom gave Odo an annual income of £.3,000 from 184 lordships in Kent and numerous manors in 12 other counties making him by far the richest tenant-in-chief in England. He was also given the custody of Dover Castle, the “lock and key” of England and then probably the most important castle in England. However, this was not enough for Odo and he set about increasing his wealth by taking whatever he wanted by force. In Dover, Odo confiscated homes and took the Old Guildhall for his household, as well as allowing one of his tenants to build a tidal water- mill at the harbour entrance in Dover which caused the harbour to silt up which had devastating impact on shipping. Odo’s misdeeds quickly made him many enemies in Kent, and by the autumn of 1067 there was open revolt against him mainly in and around Dover. Such was their hatred of Odo the Kentish rebels appealed to Eustace, Count of Boulogne for help. Eustace was himself a hated man in Dover, but apparently less hated than Odo. In 1051 there had been a brawl in Dover between Eustace’s retainers and the citizens of Dover which had caused a rift between King Edward the Confessor and Harold Godwinson which resulted in the temporary exile of the Godwinson family. 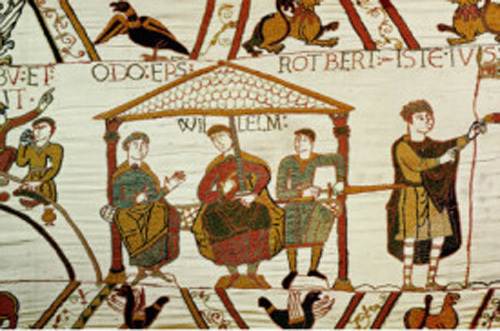 Eustace had been a loyal supporter of William I and had fought alongside him at the Battle of Hastings. However, Eustace was dissatisfied with his reward from and decided to support the Kent rebels in their fight against Odo in the hope of gaining more wealth. Eustace crossed the Channel to support the rebels in their attempt to besiege and take Dover Castle, but he soon realized the siege would fail and he returned to Boulogne. As a result of his support for the rebels his English property was confiscated by William I, but was later returned when the two were reconciled. 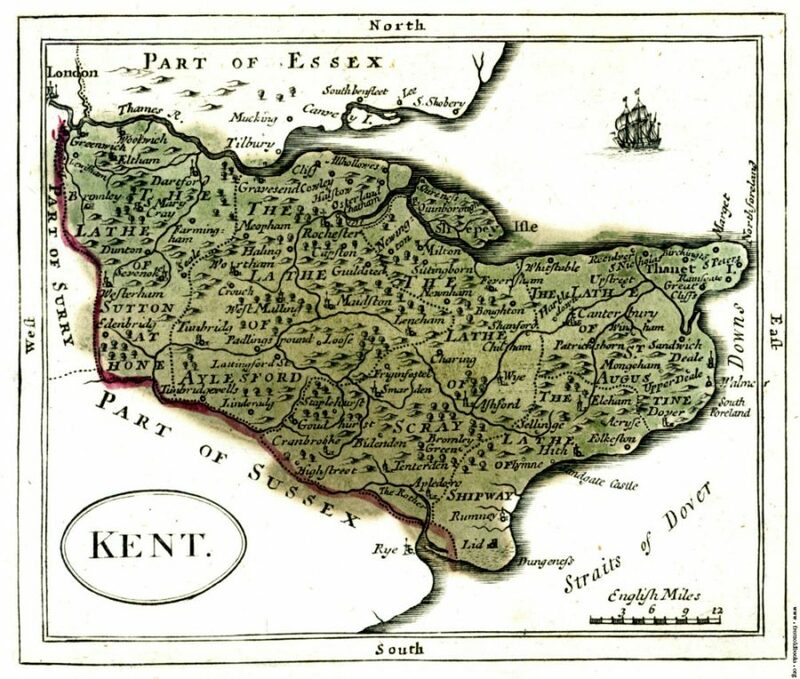 After Eustace’s retreat to Boulogne the Kent rebellion soon failed and Odo regained control of Kent. Now secure in his tenure Odo continued to increase his wealth by whatever means he saw fit which soon brought him into direct conflict from Lanfranc, the Archbishop of Canterbury, who also had extensive land-holdings in Kent. In 1076 this confrontation led to Odo being brought to trial on Pennenden Heath near Maidstone accused of defrauding the Crown and Diocese of Canterbury. After the trial Odo had to return some of the illegally obtained land holdings whilst other assets were re-apportioned. Odo’s greed and ambition led to his downfall in 1082 when William arrested and imprisoned him for seditiously planning without the King’s permission a military expedition to Italy, supposedly in pursuit of the Papacy. Odo’s earldom and remaining estates were confiscated by the Crown and he was imprisoned until 1087 when William was persuaded on his deathbed to release him. 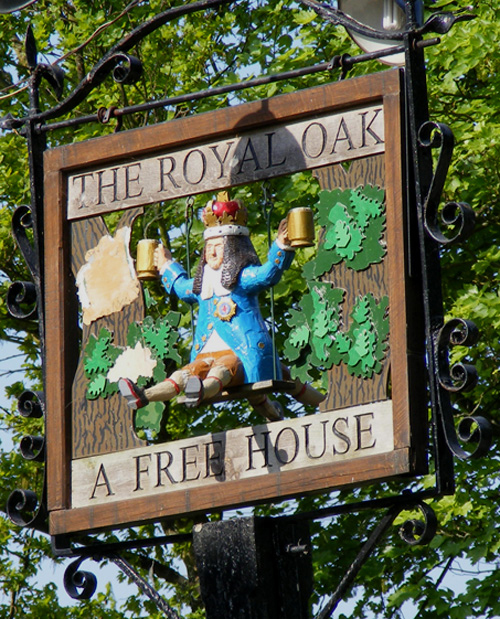 The Royal Oak sign hand-carved three dimensional pub sign hand-carved in the 1990′s by Steve Finnis, a pub regular. The last of Nonington’s alehouses to be licenced was The Royal Oak in The Drove, Lower Holt Street, Nonington, which was also the last of the old alehouses to carry on business. The pub is sadly closed at present and leaves Nonington without a pub. Hopefully it will re-open in the very near future. William Wanstall junior was licensee of The Hawks Head, formerly The White Horse, next to St. Mary’s church when it closed in March of 1832. The closure was possibly because William Osmund Hammond, the owner, had become opposed to the sale of alcohol because of his religious convictions, but more likely it was due to his concerns about the effects of alcohol on the working abilities of the lower classes. Alehouses at this time opened at six o’clock in the morning and closed at ten o’clock at night. For some six months or so after the closure of The Hawk’s Head the only alehouse in the parish was “The Redd Lyon” at Frogham. William Wanstall and John Wood obviously saw the need for an alehouse, or two, in the more heavily populated Church Street, Holt Street and Easole Street area. At the next annual Wingham licencing sessions in September of1832 William Wanstall and John Wood were both granted a licences, William for The Royal Oak and John for The Walnut Tree, both premises being a couple of hundred yards apart in Lower Holt Street. The Royal Oak was most probably named after the ‘Majestie Oak’ in nearby Fredville Park. The new Royal Oak premises was owned by by J. P. Plumptre, Esq., of Fredville as was the long established Redd Lyon at Frogham. The road running from Holt Street past The Royal Oak over the hill to the church was then known as Church Hill, later renamed Vicarage Lane, but is always referred to by locals as Oak Hill. With the granting of the licence William Wanstall became liable to pay the Parish Poor Rate on the premises. His father, also William, was the Parish Clerk in the mid-1830’s and listed for many years in parish records as a shoemaker and cordwainer. William senior first had a house and shop premises in Easole Street but later moving to premises, now called The Old Post Office, in The Drove which adjoined the southern end of the Oak garden. 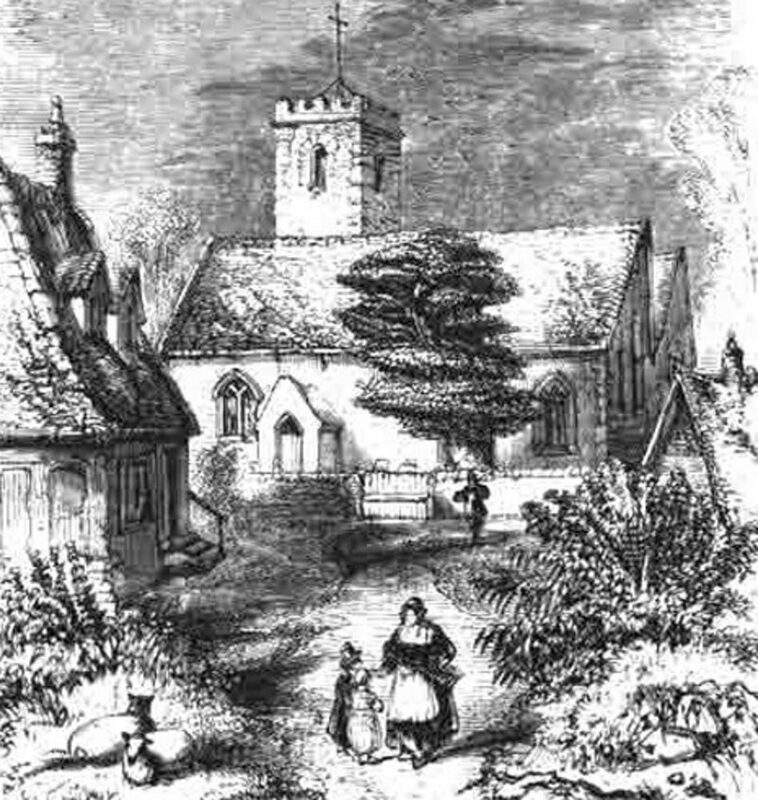 The Parish Vestry, an early form of the Parish Council had met in The Hawks Head, previously The White Horse, since at least the early 1700’s and after its closure in March of 1832 the Vestry’s fortnightly meetings were held at The Royal Oak after its opening in September of that year. Vestry meetings normally began at “eleven of the clock in the forenoon” and decided on such important matters as raising revenue through parish rates for the administration of the Poor Laws and the maintenance of the roads within the parish. Inquests had also been held in The White Horse, most likely since its opening, and they continued to be held at The Royal Oak. William Wanstall the younger died during his tenure as licensee. The Kentish Gazette of Tuesday 18th October, 1836, contained the following notices concerning his estate. “The estate of William Wanstall the Younger. Notice. All Persons who have any claims or demands on the Estate of William Wanstall the younger, of Nonington, in the county of Kent, Victualler, who hath executed a deed of assignment for the benefit of his creditors, are desired, within one month from the date of this notice, to send an account thereof to Mr. Chalk, Solicitor, Dover. And all persons who stand indebted to the estate of the said William Wanstall are requested to pay the amount of their respective debts to Mr. Chalk, who is duly authorized by the assignees of the said William Wanstall to receive and give discharges for the same. Stephen Chalk, Solicitor to the Assignees. Dover, Oct. 18, 1836”. In the same issue of The Kentish Gazette was notice of an auction of goods from the estate of William Wanstall the younger which were presumably from The Royal Oak and most likely sold in situ by Whites and Goulden, auctioneers of Canterbury, who themselves ceased trading in December of 1844. Items of household furniture, glass, china ect., the property of Mr. William Wanstall in the Parish of Nonington listed to be sold by auction on Thursday, the 20th of October, 1836 were as follows: four-post bedsteads and hangings; feather beds; mattresses; blankets and counterpanes; mahogany double and single chests of drawers; dressing tables and glasses; night chair; mahogany wardrobe; mahogany dining, Pembroke, tea, and card tables; mahogany and painted chairs; beaufet*; Kidderminster carpets and hearth rugs; mahogany bureau; eight-day clock; pier glass; register and other stoves; fenders and fire irons; bed and table linen; a variety of glass and china; kitchen and washing utensils; beer casks; kneading trough; plate rack; meat safes; brine tubs; dairy utensils; mangle; and many other useful articles. All of these items were for viewing on the day of the auction, which was to commence at mid-day precisely. * beaufet (plural beaufets). A counter for refreshments. A niche, cupboard, or sideboard for plate, china, glass, etc. ; a buffet. The type and apparent quality of the furniture listed indicates that the Royal Oak was a fairly high class establishment providing food as well as drink to locals and travellers alike. When renovations to The Oak were carried out in the 1960’s a spy hole in the form of a small trap door which looked down into the main room below was found in the floor of an upstairs room, most likely to allow the landlord to see who had entered the premises without having to go downstairs. 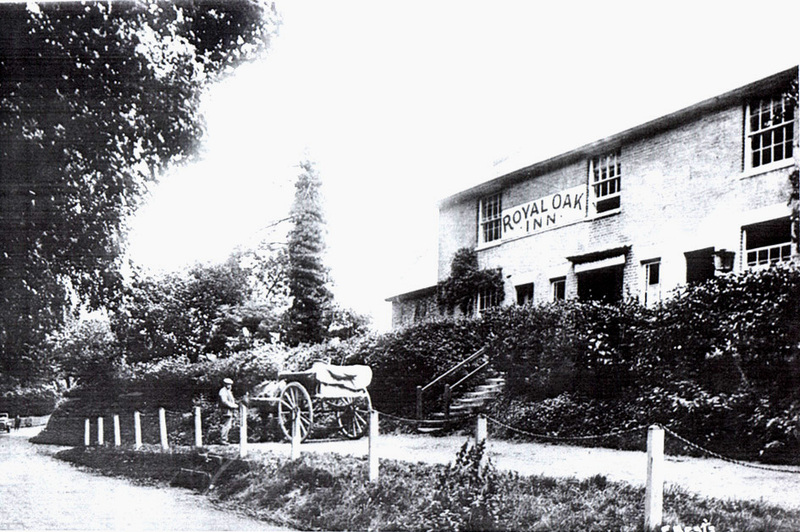 John Hopper, who had previously been the landlord of The Redd Lyon at Frogham, took over the Royal Oak from William Wanstall on November 1st, 1836. John Hopper was licensee for some nine years or so until he was succeeded in 1845 by John Nash, who in addition to being the licensee was also the receiver of mail at The Oak. Prior to its closure The Hawks Head had fulfilled a similar function. It was common for village alehouses to serve as parish post offices during the 1840’s and 50’s. On Tuesday Last the tenants on the Fredville estate with a few of their friends, enjoyed their annual day’s rabbit shooting in Frogham Wood, by the kindness of Charles J. Plumptre, Esq., of Fredville Park, in this parish. After a most excellent day’s sport the friends adjourned to the “Royal Oak Inn,” and partook of a most sumptuous dinner, capitally supplied by the worthy hostess in a style that reflected great credit on her, and gave general satisfaction. The rest of the evening was spent in songs, toasts, &c”. The hostess referred to in the newspaper report was presumably Fanny Nash, and when Leonard died in 1873 Fanny took over the licence from her late husband. Richard Jarvis Arnold, born in the parish and resident there in the 1880’s and 1890’s recalls in his memoirs which were taken down 1936 by Dr. Hardman, a local historian, that: “the public houses were The Royal Oak kept by Woodruff and The Walnut Tree beer house kept by Sheaf”. Dr. Harman noted that “The Oak had since been rebuilt” indicating that the pub underwent alterations at some time from the late 1890’s to the early 1930’s when the memoirs were taken down. These must have been mainly internal as the building appears to have retained its original external features including windows and doors. In January of 1987 the ground floor interior underwent extensive alterations, with the unusual horse-shoe shaped bar installed during the previous alterations being replaced. The widowed Fanny Woodruffe married James Stow in 1876 and her new husband became licensee and continued as such until in 1896 when Fanny again held the licence in her own right until 1899 when William Henry Sayer became the new land-lord. In 1918 William Sayer’s nephew, also William Sayer, opened a cycle repair and taxi service in stable buildings to the rear of the pub [now the car park]. The business expanded to include motor vehicle repairs and fuel sales and in 1926 to the younger William Sayer moved the business to its present premises in Holt Street which had previously been the public laundry. He continued to run the business until his retirement in 1948 when the business was taken over by his nephews, Charles and Arthur Betts. Since Arthur’s retirement the business has been run by his son, Terry. The Oak became a tied house leased by local brewers at some time in the late 1800’s. 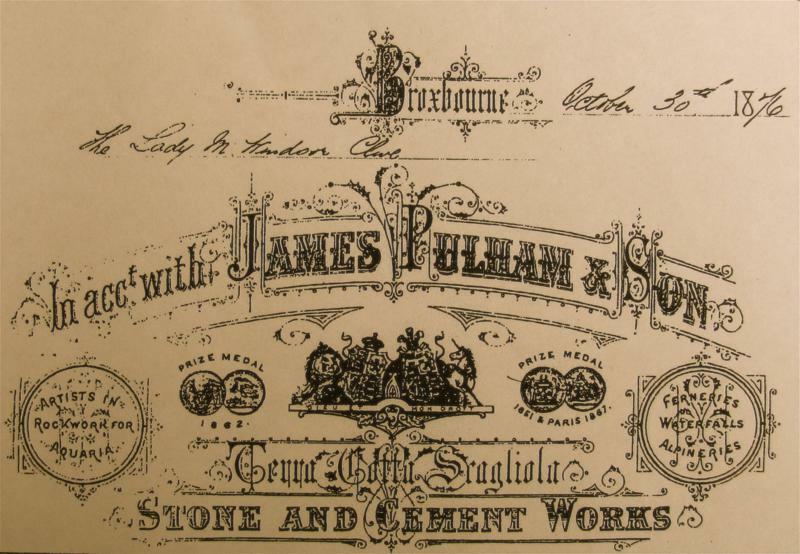 The earliest known brewer was Gardener & Co. Ltd. of Ash whose brewery in Sandwich Road in Ash dated from 1837. In 1951 Tomson & Wotton Ltd or Ramsgate amalgamated with Gardner & Co Ltd of Ash to form Combined Breweries (Holdings) Ltd. which was acquired by Whitbread & Co Ltd in 1968. Subsequent landlords of The Oak included William George Hoare, who was at the pub from September of 1923 to October of 1926, and Walter Henry Purbeck, a former Metropolitan Police officer, who was licensee of The Oak until 1939. Arthur Balcombe was landlord from 1939 until 1945, the Second World War years. During the war Canadian soldiers stationed in Fredville Park and other parts of Nonington used to go into the pub. This sometimes caused friction with locals as the soldiers often consumed large quantities of beer which caused the pub to run out, and new supplies were difficult to obtain due to rationing. Margaret Balcombe, his daughter, married Frank Webb, my uncle, Arthur Balcombe was landlord from 1939 until 1945, the Second World War years. During the war Canadian soldiers stationed in Fredville Park and other parts of Nonington used to go into the pub. This sometimes caused friction with locals as the soldiers often consumed large quantities of beer which caused the pub to run out, and new supplies were difficult to obtain due to rationing. Margaret Balcombe, his daughter, married Frank Webb, my uncle, when he was on home leave from overseas wartime service in the R.A.F. After the war Reg Reynolds took over, and his daughter Coralie married Ken Theobald, a local man. Coralie still lives in Nonington. Reg Reynolds was followed in the late 1950′s by Charles Kerr, who in turn was followed by Tony Usher, an ex-Royal Navy diver. In the late 1960’s Nick Larsen, an ex-Metrolpolitan policeman, took over until 1975 when The Oak went from being a tenancy to a Whitbread managed house with several mangers who included Nigel Turnbull and John Nicholson. The pub reverted back to a Whitbread tenancy when Roy Faye became licensee from 1979 until September of 1988 when Peter Addis became landlord of the now free house. Until the early 1960’s The Oak also had ta tea garden, serving teas to cricketers and the general public in a building at the end of the garden. For many years it was the ‘local’ for students at the nearby Nonington College of Physical Education until the College’s unfortunate closure in the mid-1980’s. An edited version of this article by Peter Hobbs, the present owner of Old St. Alban’s Court, was previously published in Archaeologia Cantiana Vol: 138-pages 291-299. Mrs Ina Hammond lavished care and attention on what the youngest of her grandchildren knew as ‘Grannie’s Garden’ where frogs abounded in the 1920s. They still do but her elder sister recollects only being chased off the rocks by Sayer the Gardener. 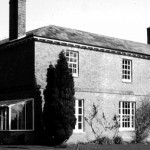 (29) There are some grainy photos of small conifer planting in sites where there are now large trees and there are local recollections of children opening the sluice in the old kitchen gardens and running along the road to watch the water surge out of the Dropping Well in the sunken garden. (30). The 1937 Sales catalogue describes the area as “Large Sunk Garden with wide grass slope in centre and dripping well sheltered by large beech and chestnut trees …”and is accompanied by the photograph shown in Fig 5.